Allow me to emphasize some key and/or salient points here: 1. There are fifty states in this great nation. 2. Each of these fifty states is pretty important in the lives of the people who live in them. 3. There are lots and lots of cities in many of these fifty states. 4. I, Mark Aldrich, however, have only one hometown, and that hometown, Poughkeepsie, was voted Halloween Central in 2013 by a major little-known Canadian institute of Counting Things up to High Numbers and Making Assessments and Drawing Conclusions in Extremely Professional Ways. Do they measure the assessments or assess the measurements? Whichever. It was exciting news for me. Would you like more candy corn? The Washington Post expressed its confusion with a judgmental headline, “Is Poughkeepsie, N.Y., the best place to trick-or-treat tonight?” Okay, it was not all that judgmental. I think it was a little sneer-y. A little dumbfounded. Perhaps a little, um, jealous? And how, do I ask, how did the MPI come to its conclusion (since we both love my hometown so much, I think I can call the Martin Prosperity Institute by the more informal “MPI” or even “Marty”) that Poughkeepsie does Halloween better than … oh, I could write the name of every city in the country here, but I am no Grinch … better than every-damn-body else? Now, while Poughkeepsie did not rank first in any one of these five categories, which is usually not a good way to win surveys, it ranked so high across the board that it beat second-place Chicago, Illinois, (the 2012 winner). What? (Needle-scratched-across-record sound effect.) Chicago is a great-big city with big buildings! Poughkeepsie? Jackson, Tennessee, was found to have the greatest number of costume stores per capita. Ocean City, New Jersey, had the most candy stores. 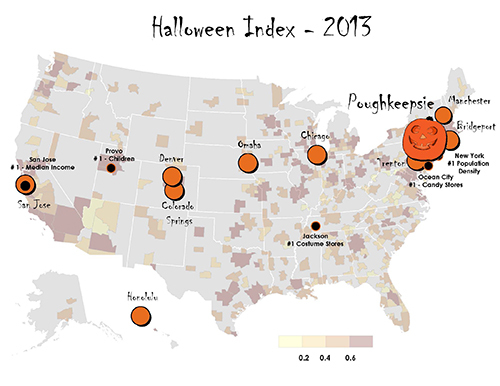 But Poughkeepsie’s high average income and large number of costume stores sent it to number one. See? Poughkeepsie has the biggest pumpkin! According to itself, the Martin Prosperity Institute “is the world’s leading think-tank on the role of location, place and city-regions in global economic prosperity.” Marty is based in the Rotman School of Management in Toronto, Canada, which is itself a lovely city and might be a great Halloween destination for the adventurous Halloween traveler, but it is no Poughkeepsie, it must be said. It should come as no surprise for those of us who grew up in Poughkeepsie that our hometown is the fake spookiest or candy-sweetest or simply the best Halloween community in all of America. Any October visitor might notice how many fly-by-night (erm, seasonal) costume stores appear along the Rt. 9 corridor every fall, or the large number of short-lived candy shops, or professionally run haunted houses, or the fact that there is a gigantic freaking (and real, not pretend) cemetery alongside miles and miles of the Rt. 9 corridor. For those visitors—business travelers and ghouls alike—this study makes plenty of sense. The discovery that Poughkeepsie is the best Halloween city would have made a lot of sense to my sister and our elementary school friends and me if you’d told us this back in the 1970s. Like all suburban kids, we thought of Halloween as the ideal job: get paid—in candy!—for wearing different clothes. Why is this only once a year? I was never a particularly enthusiastic trick-or-treater. To be honest, until I was a teenager, I was rarely enthusiastic, period. As a less-than-enthusiastic cub scout (also different clothes), I remember the task of selling items from the most boring scout catalog imaginable (two items that I remember are plastic campground dining gear and peanut brittle that most years lasted longer than the plastic camping gear). But that job taught me my way around the neighborhood, so I knew which houses were owned by people I did not like seeing in bright daylight, much less at dusk with a pumpkin basket in my hand. The plastic shop-bought masks from that period—Fred Flintstone, Spiderman, Superman—were each identical except for the paint job on the front, they did not line up over my eyes much less my eyeglasses, and they were held in place by the flimsiest rubber band yet devised by human ingenuity. Oh! and I could not breathe in them. Each had a cape—even Fred Flintstone, I seem to recall, or perhaps this was an example of my mother’s ingenuity to keep me warm—and none earned me much candy. My less-than-enthusiastic cub scout side always beat out my slightly more enthusiastic begging-for-candy side. One Halloween night, in 1979, I was allowed to venture on foot, in costume, and not accompanied by adults (hold that thought for a second, please, while I address my parents: What!?!) from my neighborhood to my best friend’s neighborhood, which was connected to mine by Barnegat Road. You may not know Poughkeepsie like I know Poughkeepsie, so please understand that The Woods, the scary woods I just mentioned, borders Barnegat Road. Do I need to repeat this? Do I need to color in the dots or connect the lines for you? My best friend, Doug, loved to tell tall tales. I did not want to think of them as lies, but they were. “Tuesday” was a sufficient reason for him to reveal that he had a secret family in California and his absence from school yesterday was because he had been there and back in one day. Each time he hosted me for a sleepover, he would reveal to me that there had been a plane crash in The Woods the night before that no one was investigating (there had been no such incident) or a car had plunged down the embankment into The Woods the other night and exploded and the driver got out on fire (there had been no such accident) or his Polish grandmother had told him that there would be ghosts in 1979 that hadn’t been seen in many many years (he had no Polish grandmother). Halloween was when he turned pro. Doug was and still is five days younger than me and creatively lazy and these two facts made him a respected authority in my eyes. (I hope he is someone’s parent nowadays.) We are both about to turn fifty in three weeks. At just the perfectly wrong moment, while he and I walked from his neighborhood back to mine, loot in our identical plastic pumpkin pails, just as he was committing with his words some luckless fictional airplane pilot to a fiery death earlier that very day a mere few feet from where we were walking along Barnegat Road, just then, my flashlight went dark. We started to walk at a faster pace. Barnegat Road has very few streetlights along the stretch beside The Woods, and even fewer in my memory. The one we passed under with my newly dead flashlight sizzled and went dark. Night has never been so loud or so silent in all the years since for me. I had never seen a night so dark or learned of a death so credible, thanks to Doug’s cheerful rendering. Just then, we heard a sound. A low, rasping scream of an anguished, crying creature—Doug had found his true calling as a storyteller, at least this one night, because he finally seemed to believe his own tall tale, and we both bolted from what was obviously the ghost-tortured mortal remains of his burned-up pilot or the hungry specter of a train engineer come to steal us from Poughkeepsie, New York, which for us was already and always will be the best Halloween city in the country. This is a re-write from 2013. Hi Judy, and thank you for your comment six weeks or so ago, too. I’ve really had a pretty bad block about writing at all. I allowed some chaos in my life to distract me from what I want to be doing. The publication for which i started to work in 2017 did not help me out and I did not know how to ask for the guidance I needed. Let adrift like that, my reports earned very few views (still more than this website) and not enough to earn me any money. That website was one of the ones that Facebook silenced a couple weeks ago, incorrectly and unfairly, which is leading to articles about my old website in major publications like Rolling Stone. To quote Maxwell Smart: “Missed it by that much,” but I am not certain for me what I missed. I miss WP’s Daily Prompt service, which I have seen was discontinued in May (I also saw that you tried to campaign for its restoration). Happy Halloween to you, too! I hope you continue to be well. That mention in Rolling Stone might jumpkick your blog again. Hope so. I miss reading your words.